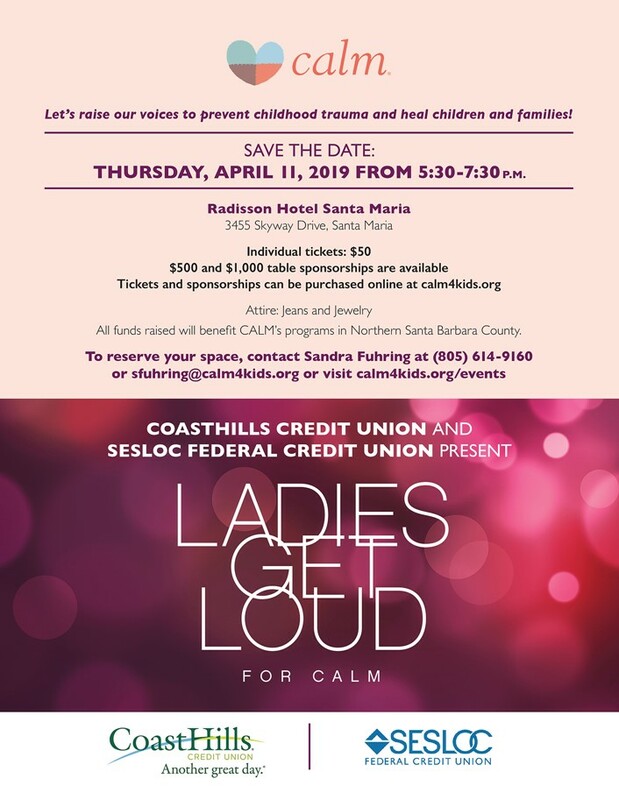 Ladies Get Loud for CALM: Thursday April 11, 2019, 5:30 PM to 7:30 PM. Several of our guys are serving as waiters. And, there are still four sears for ladies to sit at the Rotary table. 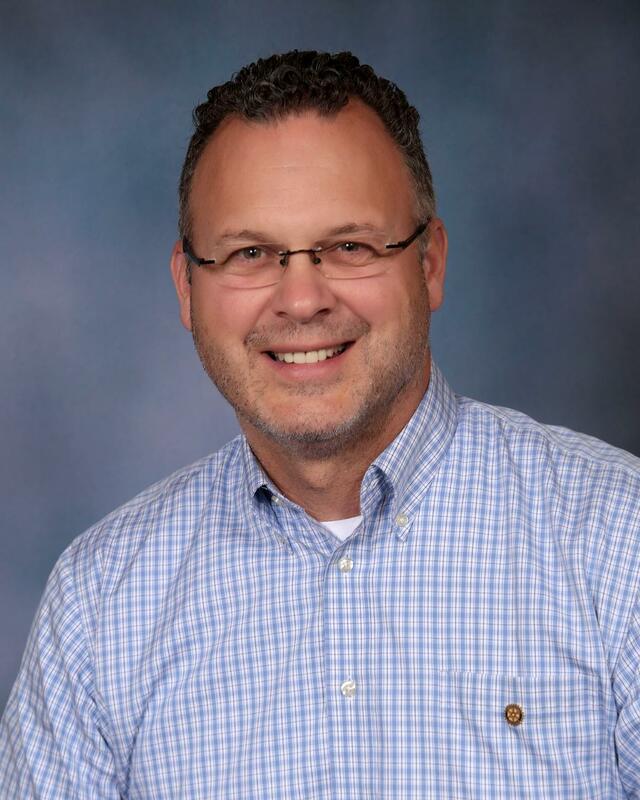 Let Mike Gibson know if you are interested. 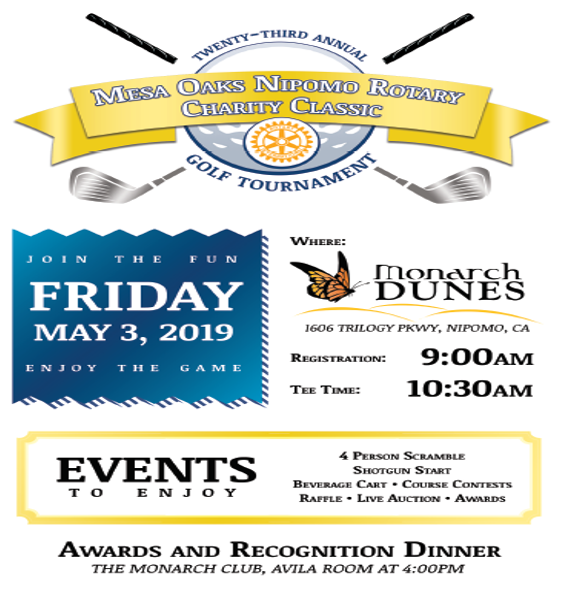 Serve Santa Maria: Saturday May 4, 2019. If you are interested in organizing and/or participating in a local clean-up day, please contact Jason Stillwell for more information. 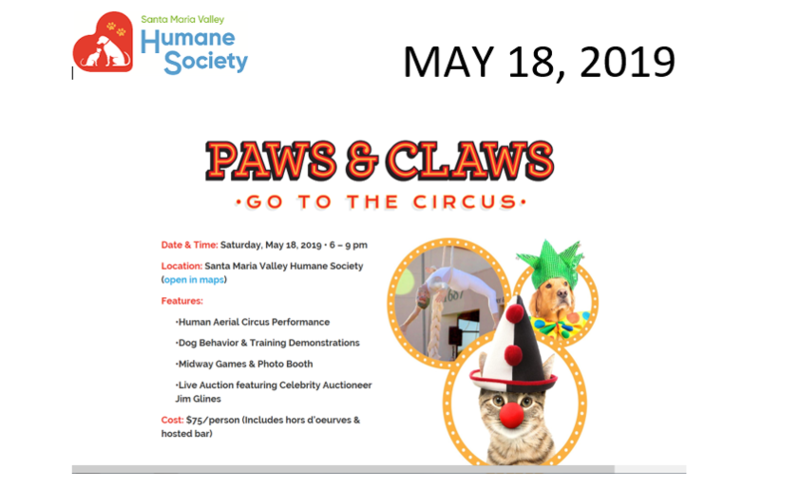 Paws & Claws Fundraiser: Saturday May 18, 2019. 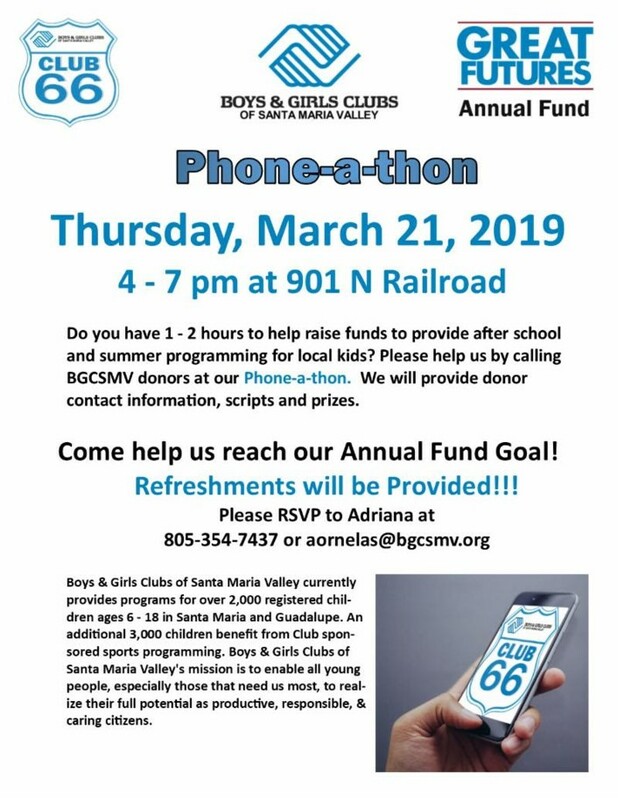 See Carol Bradfield for more details. 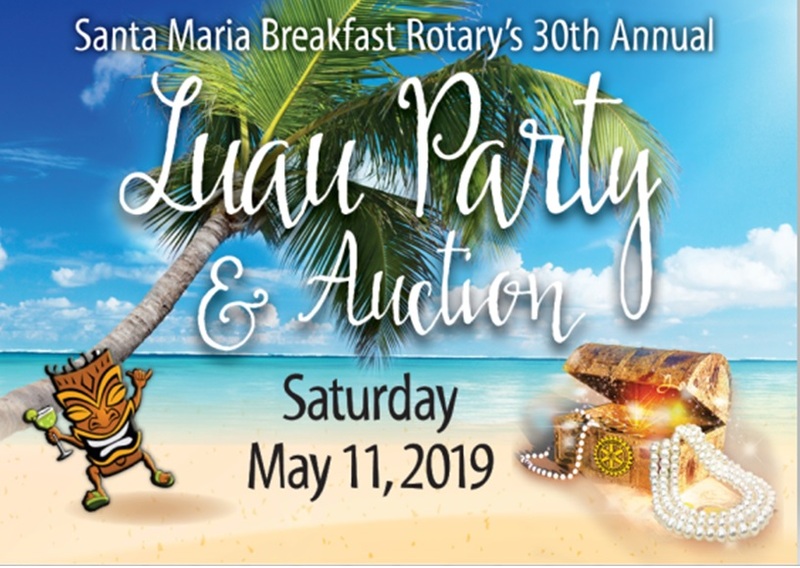 LUAU Party & Auction: The date is fast approaching. All Rotarians are urged to get their auction items in and their tickets sold. Work dates: May 1st, 3rd, 6th, and 10th. There are fewer dates than we have had in the past, so we need everyone to sign-up on the specified dates, more than anything we need people – about 25 each date. Jason bragged on the club for accepting him. He has been an official member for about two and a half months, and has really felt welcome. There was a comment about Jason and Instagram, to which David LeRoy reminded the group that most of us don’t know what that is. Andy Caldwell bragged $100 on Dave Wright, and he asked Dave to explain. Dave’s father was a survivor of the Bataan Death March. Each year there is a memorial march to commemorate and acknowledge survivors. 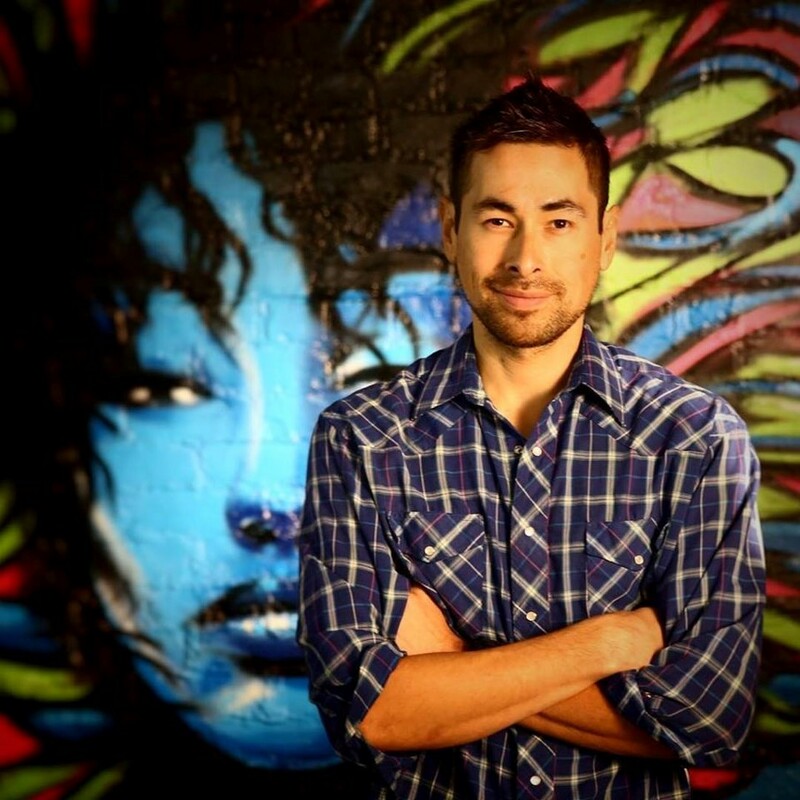 Dave recently went to participate in the march, intending to complete only about half of it. He wound up completing the entire march. Jerry Schmidt bragged $50. He bought a new truck from Toyota of Santa Maria. Dealing with David Leroy was such a joy, everything was easy. David Leroy matched the brag for $50, stating Jerry bought an awesome truck - you can check it out on Instagram. J David bragged another $50 because he just got back from a NASCAR trip. What a great experience. They got to do the parade lap and be in the Toyota suite. Best part - Kyle Bush won. Roberto Rodriguez bragged $25. He attended the youth of the year program in Carpinteria. Ten kids participated in the program and a Boys and Girls club student from Santa Maria won. The student will now participate in the state youth of the year program. He (Eric P. From Pioneer High School) is a great kid and has an excellent chance to win it all. Roberto also bragged on Mike Gibson for being a judge. Mark Jackson bragged $100 on his wife. Her mother fell and broke her hip. Deb spent 20 days with her mother at the care facility. She is a credit to being a good daughter. 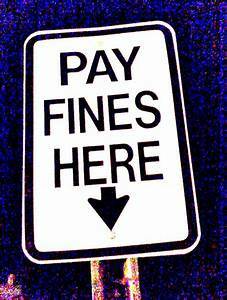 Ryan Swack was fined because he did not brag on his boys who were giving back to the YMCA. They were helping with the sale of lemonade?? at a recent YMCA event. Shannon Seifert also talked about the white-cello lemonade?? At any rate Shannon feels that Ryan’s boys will be great salesmen someday, and bragged $50. Jim Small was asked to explain his train ride from northern California. The train was late, over an hour because there was a fire in one of the sleeping cars. Then they got south of Watsonville and because a poll had fallen on the tracks they were delayed again. Then the sleeper car caught fire again. They left the train car in Salinas. The train finally got to SLO at 11:00 pm. Jim had to endure the train ride, and then got hit with a $30 fine. That’s just not right! Jason Stillwell and Jason Francia were each fined $30 because they had on each other’s name tags. At least they had half of their name right. $1,000 Cheesecake? 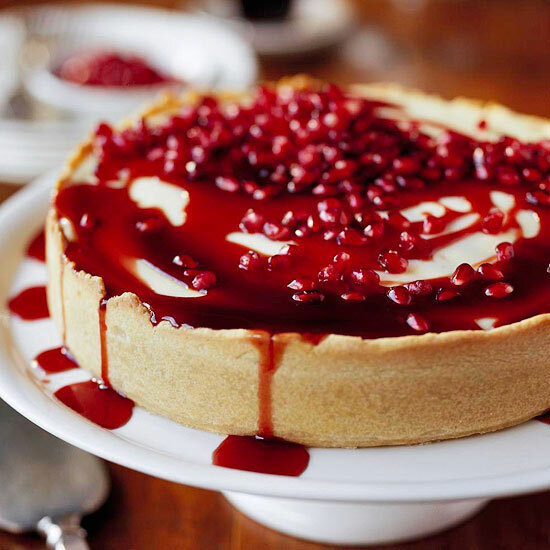 It was discovered that Debbie Blow's homemade Pomegranate Cheesecake brought in over $1,000 at the recent OCAF Gala. In lieu of a fine, Debbie had to promise to make a cheesecake to raffle at an upcoming Rotary meeting. 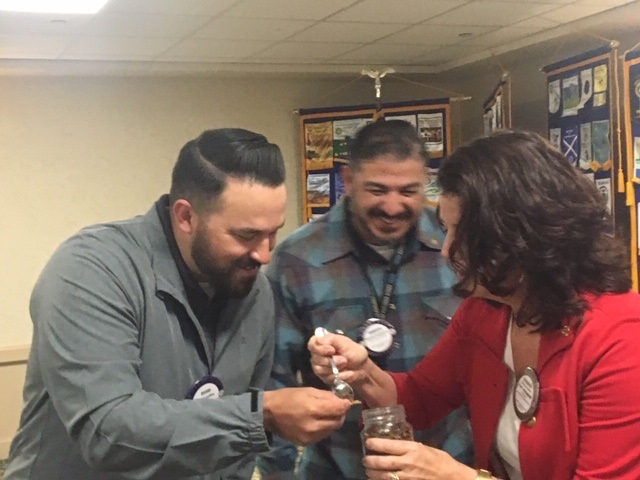 The topic for this week's program was around Edible Bugs and was presented by Aly Moore. Aly has a Master’s degree in public health policy from Yale. Her interest in edible bugs started as she was trying to find ways to grow food supplies in small areas. She now works in the edible bug space full time. 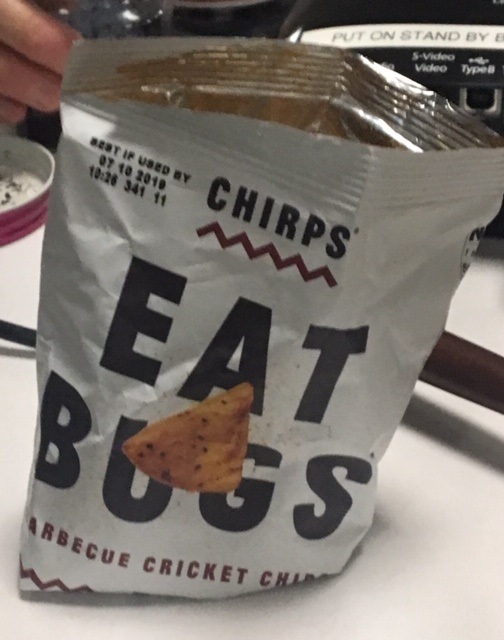 Aly discovered the option of using bugs as a food source about six years ago in Mexico. She had a taco made with grasshoppers and it tasted great. Originally all she wanted to do was prank her family at Thanksgiving by serving bugs as part of the meal. She grew to appreciate the industry and wanted to find more sources and ways to serve bugs. She found that there were many options and started blogging, growing a small following on Instagram. They taste good, they are nutritious, and they are easily sustainable. Bugs are part of gluten free, vegan, and Paleo diets. They are sustainable, nutritious, and possibly delicious. The cricket industry alone in the US is over $1 billion. Biggest cricket farm is in San Francisco, again, you don’t need a lot of land. The lifespan of a cricket is about 6 weeks. Sustainability wise, it takes about 2,000 gallons of water to raise beef, and about 1 gallon to raise a bug. Crickets are 66% protein by weight and have the same or more protein than beef. Crickets have one third of the bad fat that beef has, and tons of probiotics. Bugs don’t take the space that beef does - about a Taco Bell size versus a pasture size. I'm not sure that Aly convinced many of our group to give up their beef and go with a Bug diet. However, a few brave souls did give it a try.